I’ve always been a person who loves routine. Earlier this week, I was thinking about some of the foods, supplements and drinks that I ritualistically consume everyday, and I had to laugh. I get so used to doing things a certain way that I don’t even realize that some of the things I do everyday are pretty far out of the norm. I didn’t even know most of these parts of my daily diet existed even a year ago! And yet, I rely on them to fill my tank and help me feel my best. I thought I would share five of my — rather unusual — kitchen staples that are part of my daily routine. I’ve always been a big tea drinker, but it wasn’t until earlier this year that I discovered Kombucha. Kombucha is a fermented tea that is rich in probiotics, the good gut bacteria (like those in yogurt) that have been shown to boost immunity and overall health. I first discovered Kombucha in the refrigerated produce section of my local grocery store. Some people claim that it can heal everything from digestive problems to arthritis to cancer. Kombucha has the most health benefits when it is unpasturized, which is hard to find in the store-bought versions. I started brewing my own about six months ago, and I’ve had some brewing constantly ever since. It has a very distinct, sweet, but tangy flavor. Once it is bottled, it builds up quite a bit of carbonation, so it’s a great treat for someone like me who doesn’t drink soda. 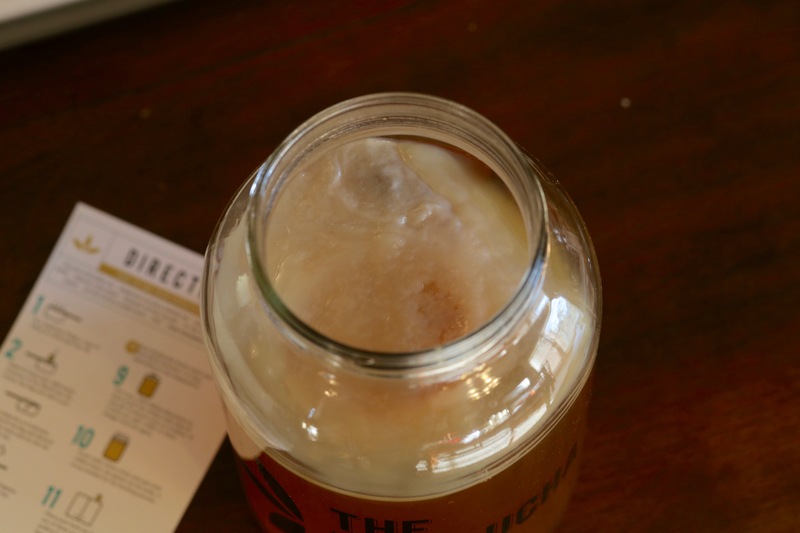 To brew your own Kombucha, you need a SCOBY, which is a symbiotic culture of bacteria and yeast. As the tea ferments, the SCOBY will grow in size. You can watch a funny video of my daughter and I picking up the SCOBY for the first time by clicking here. 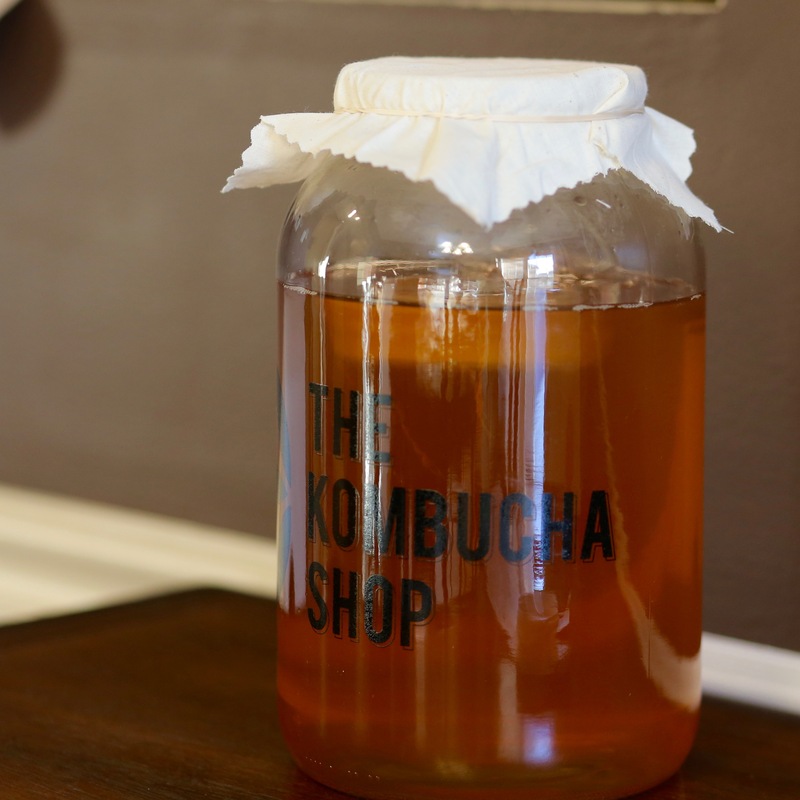 It takes each batch of Kombucha about two weeks to ferment, so be prepared to dedicate a good chunk of kitchen counter to the project if you decide to take it on! One of the first things I do every morning is consume a serving of collagen peptides. (I get mine from Thrive Market.) During the past year, I have regularly struggled with intense joint pain. I love mixing collagen peptides into my morning green tea latte to give my system a boost. Not only does collagen help with joint pain, but it’s also known to improve skin, hair and nails, promote better sleep, keep bones strong and improve digestion. First I brew a cup of green tea. In my blender, I add a scoop of collagen peptides, 1/4 cup of full fat coconut milk, a teaspoon of raw honey and the hot green tea. I hit the pulse button about six times on my blender to create a frothy latte. Not only does it taste great, but it’s also very filling! I’m not as consistent with my bone broth consumption, but I have started trying to make bone broth as often as I can. Bone broth is one of the most healing, soothing and nutrient dense foods that you can consume. Bone broth is rich in gelatin, which is known to heal the gut. It also is a great source of protein, and helps restore collagen to promote healthy joints, hair, skin and nails. If you are like me, you probably spent most of your life believing you shouldn’t consume fat. These days, I actually go out of my way to make sure I am eating plenty of healthy fats each day. These include extra virgin olive oil, avocado oil, coconut oil and MCT oil. I have recently started adding MCT oil to my hot drinks to create a “bulletproof” coffee or tea. “MCTs” are medium-chain triglycerides, a form of saturated fatty acid that has numerous health benefits, ranging from improved cognitive function to better weight management. Medium-chain fats are digested easily and sent directly to your liver, where they have the ability to positively alter your metabolism. This is one reason many people claim that MCTs, including coconut oil, are burned by the body for energy, or “fuel,” instead of being stored as fat. MCT oil is supposed to help you maintain a healthy weight, increase energy, improve your ability to think clearly, improve digestion, balance hormone levels and fight bacterial infection and viruses. If I ever get stranded on a dessert island, I am going to be well aware of the many benefits of the coconut! Because I don’t eat grains or dairy, I use coconut products in many forms throughout the day. I start my morning with full fat coconut milk in my latte or smoothie. I cook with coconut oil and use coconut butter as a topping on sweet potatoes or butternut squash. For a snack, I often eat coconut yogurt or coconut ice cream. And I often use unsweetened coconut to make treats. One of my favorite snacks is to mix a ripe banana with 2/3 cup of shredded coconut and some cinnamon. Drop by the spoonful on a cookie sheet and bake for about 15 minutes to make a super easy and yummy cookie! So, what do you think? Are any of the things I mentioned a staple in your kitchen? Have you tried any of them? Do you have any unusual rituals that have improved your health? Leave me a comment! I would love to hear about i! I want to spend a week in the kitchen with you!! I would love that! Come on over! I don’t think I could ever do the Kombucha thing.. not a tea drinker, BUT, I do the collagen everyday in a smoothie or coffee and coconut oil is a staple here, too… smoothies, coffee, cooking… skinny chocolate (cocoa and melted coconut oil and sweetener of your choice… delish!) and MCT oil… that’s mixed in smoothies, coffee, drinks like Good girl moonshine (2 TBSP Apple cider vinegar with the Mother, 1 tsp fresh ginger minced, sweetener, 1 qt. jar of ice, pour over and add water to the top or sparkling water for fizz)…. all of these are SO good!!! I love Kombucha! I’m big on coconut oil, but I’ve never thought about trying collagen. Sues, what brand of kombucha do you drink? Or do you make it? Great blog, Emily. How fun to get a kind of demonstration of your daily life and some really great tips on healthy ideas.